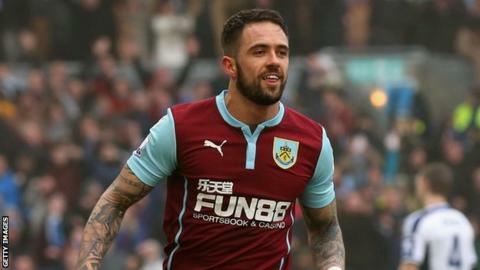 Burnley manager Sean Dyche says striker Danny Ings should remain in the Premier League to help him improve his game. Ings, 22, is out of contract with the Clarets in the summer and is rumoured to have signed a pre-contract agreement with David Moyes's Real Sociedad. The former Bournemouth player was linked with moves to Liverpool and Tottenham during the transfer window. "For his development he wants to be in the top end of the Premier League," Dyche told Sky Sports. "It is the most powerful league in the world. His aspirations need to be top end of the Premier League. The middle of La Liga is no use. "That is not doing us down, it is the reality of the market we are in. If I had seen him play at Manchester United on Wednesday, I would be knocking on the door to try and get him." In an interview last week, Moyes, whose side are currently 11th in La Liga, said Ings was a player "anyone would like to have". Reports emerged at the weekend, claiming Ings was flying to Spain for a short visit. Pictures then appeared on social media, apparently showing the striker having a meal with Moyes. However, it has now been established the images were fake, something Burnley's official Twitter feed highlighted themselves, although that posting was quickly deleted. Ings, who has scored nine goals for Burnley this season, moved to Turf Moor from Bournemouth in August 2011 for a fee of about £1m.